Sama Alshaibi is part of Tucson Museum of Art’s exhibition Dress Matters: Clothing as Metaphor from 21 October 2017 - 18 February 2018. Dress Matters: Clothing as Metaphor is a group exhibition that examines clothing in art as symbols of power and identity. At once functional and aesthetic, garments are worn to protect the body from the elements, enhance the beauty of the wearer, establish rank in society, and signal to others our differences or similarities. Garments also point to interpersonal issues and conditions as well as larger societal and cultural concerns. Works in this exhibition reveal how artists use concepts and images of clothing to relay compelling messages about gender, age, ethnicity, history, profession and the world around us in general. 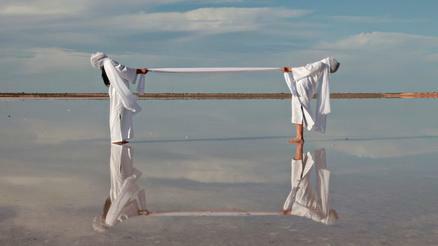 Alshaibi’s is represented with her video Wasl (Union) from artist’s Silsila series. Silsila — Arabic for ‘chain’ or ‘link’— is a multi-media project depicting Alshaibi’s many-year cyclic journey through the significant deserts and endangered water sources of the Middle East and North African region. By linking the performances in the deserts and waters of the historical Islamic world with the nomadic traditions of the region, and the travel journals of the great 14th century Eastern explorer, Ibn Battuta, Alshaibi seeks to unearth a story of continuity within the context of a threatened future. More than 50 artists are represented in the exhibition, including Bob Carey, Angela Ellsworth, Miriam Schapiro, and Andy Warhol. A conversation between Sama Alshaibi and the museum's chief Julie Sasse will be held on 9 November at 5.30pm at the Tucsan Museum of Art and Historic Block. Image: Sama Alshaibi, Wasl (Union), Silsila series, 2017, video, 9:27 min.